Where to find them: Halmahera Islands, Banda and Aru Islands, Bismarck Archipelago, Moluccas, New Guinea, Admiralty and Solomon Islands and the Cape York peninsula of Australia. Roosting: The common tube-nosed bat roosts individually on the trunk of trees or branches. Their wings are covered with irregularly sized and spaced, yellow spots that act as camouflage while they roost. Diet: N. albiventer is primarily frugivorous, however it may also eat nectar and insect remains have been found in the stomachs of a few specimens. To eat fruit, the bat will hang horizontally biting off small chunks of fruit. Unique traits: This bat has a unique face, with long tubular nostrils and very large eyes. 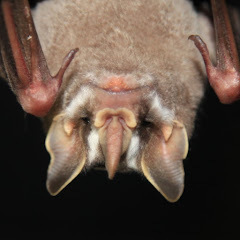 The function of the tubular nostrils is unclear, however they could aid in finding fruit through olfaction or be used in the production of sound as the nasal tubes stretch and vibrate when the bat emits a high whistling call. Recent research: N. albiventer has been of interest in various feeding studies. One study documents the fruit handling behavior in both Old World (Pteropodidae) and New World fruit bats (Phyllostomidae). 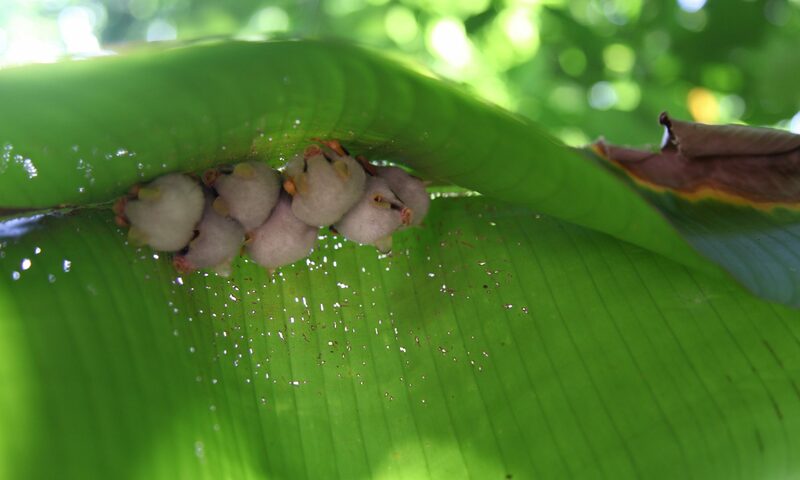 While there is variation in the fruit handling behavior among all bat in this study, N. albiventer primarily held fruit with their stomach as opposed to with their wings, like most New world fruit bats (Vandoros & Dumont 2004). Videos from the Santana Lab at the University of Washington. We study morphology, behavior and ecology in bats and other mammals.